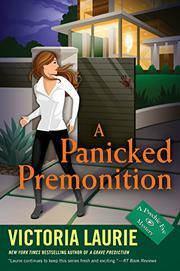 When a partner in her husband’s panic-room business goes missing, a psychic investigator tries to keep her cool long enough to figure out if the partner’s gone rogue or if he’s trapped in something bigger. The seriously wealthy of Austin, Texas, not content to spend beaucoup bucks on their seven-figure houses, are retrofitting those houses with top-of-the-line, post-hoc panic rooms. Although best friends Abigail Cooper and Candice Fusco try to stay out of their husbands’ business of building these rooms for the upper crust, they can’t help but get saddled with some of the administrative and sales work involved in the process. When Dave McKenzie, the third partner in the venture, goes missing after a normal day’s work, Abby and Candice lead the search. Making nice with the rich and snooty isn’t really Abby’s area of expertise, but investigating is, since she’s a real-life psychic and a regular consultant for the FBI, of which her husband, Dutch, along with Candice and her husband, Brice, are also agents. Soon after the set of friends begin their investigation, they turn up a lead: a bloody handprint at a crime scene that they think is Dave’s. But the handprint also acts as a lead for the Austin PD, who believe Dave may be implicated in the multiple homicide at the site where the print is found, and they begin their own investigation to find him. Abby taps into her psychic eye when she can, though her suspicions seem to lead her back to uber-wealthy meanie Murielle McKenna, who’s got her own eye on Dutch. Does Abby’s gift offer special insight into Dave’s whereabouts, or is she blinded by her hotheadedness? Dave’s life may depend on the answer. Wisecracking Laurie (A Grave Prediction, 2016, etc.) is often amusing, but she might be more consistent in indulging her comedic asides and applying her well-reasoned motives to the big reveal.